New in this week! Click on caption for more info. 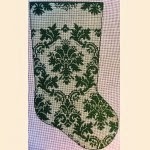 Stocking soon to be posted. Brick cover painted on 13 count, available separately for $119.00. Thread kits includes PepperPot silks, High Cotton, Threadworx overdyed perle cotton, Felicity’s Garden and Annabelle’s Playhouse. Depending on the stitch selected for asparagus pepperpot can be used individually or doubled over. Holy Spirit could go easily into one of Lee’s self finishing round ornaments in gold, or silver. Not pictured but I do have these in stock. Yes lousy picture, process of selecting threads to assemble a thread kit and haven’t taken a better picture yet. Its on 18 count and not enormous. More like the size of a stocking that was the norm when I was a kid! Toe 7 1/2″ wide, overall lenght 13″.